Scallops! It should be what's for dinner. Why? Plenty of reasons. First and foremost, they are mouth- delicious. Second, they're a good source of nutrition. The average serving size is 4 ounces and serves up a whopping 19 grams of protein for only 100 calories. Third, they are that magic phrase; "gluten free." And last but certainly not least they are quick and easy to prepare. For the beginner, here is a great recipe from Pop Sugar. Place a skillet over medium-high heat on stove top until completely heated. Spray scallops with cooking spray, and then salt and pepper right before placing on skillet. Carefully place scallops in hot skillet. Sear 3-5 minutes or until browned, flip sides, and cook another 2-3 minutes. 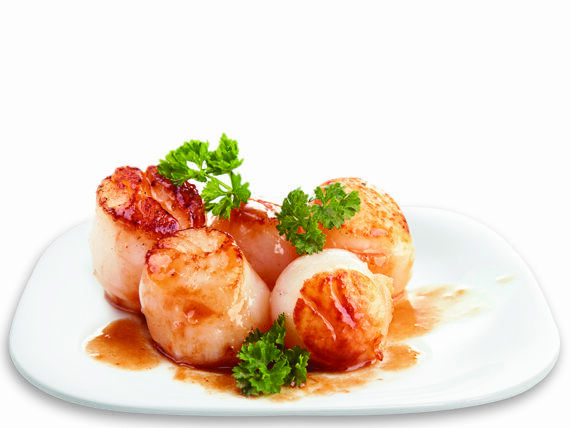 Remove scallops from skillet and keep them warm in your oven at the 175 degree temp. In same stove top skillet, add wine to de-glaze the pan, or use a wooden spoon to scrape the brown bits from the pan. Add onion, and bring wine to a boil. Boil for 5 minutes or until liquid reduces to 2 tablespoons. Over low heat, whisk in butter cubes, 1 tablespoon at a time, until fully incorporated. Stir in parsley and green onion. Salt and pepper to taste if needed. Pour over your warmed scallops and voi-la! For more great recipes, follow us on Pinterest or check out Pop Sugar, one of our favorite sources.